You write a good music review – I always want to buy the album after reading them. Nothing is more annoying than when you get sick of a favourite album from overplay – so, yes, I have learnt the art of drip-feeding as you point out. I got it! Love it – gets better each time I listen. Thanks for making us aware of this. I’ve heard of it, but never heard the record till now. I especially enjoyed the last two songs you cite. Hi Addicted, I do hope you like the album. For me, it’s been one of those where people rave about it and it wins a stack of awards and you think, Wow, has it all been hyped up too much? But nothing could be further from the truth: it’s just so god-damn good. Also, you know how sometimes you just want people to fall in love with the albums that we’ve fall in love ourselves? This is one of those. Hi Geoff, great that you dropped in. 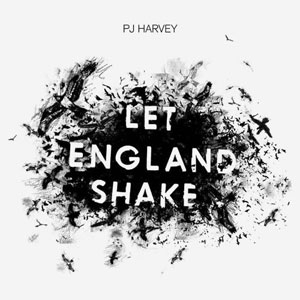 I wholeheartedly recommend ‘Let England Shake’ – it’s just perfect, in a ramshackle way, if that makes sense. PJ Harvey is a genius! Three cheers for that, Chantal!! !